The leader of 'down to earth cool', Emma Cook is a firm favourite at Donna Ida, both in her stunning designs and friendly personality. With the hottest celebrities such as Rihanna, Katy Perry, Claudia Schiffer and Angelina Jolie all draped in her newest designs, it is no wonder that this woman is quickly taking over and ruling British fashion. This title is unsurprising, when you consider her fashion background. 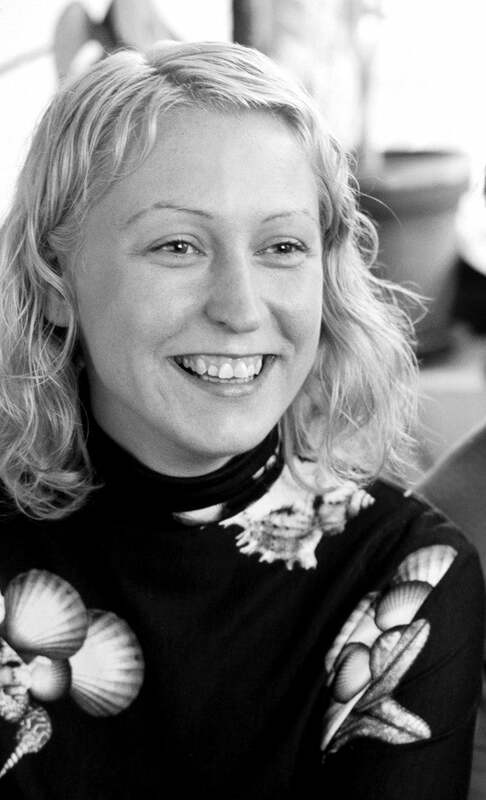 Emma Cook graduated from Central St Martins in 1993 alongside iconic designers such as Stella McCartney and Alexander McQueen. Upon graduating, Cook started her career working for various stores and boutiques significantly increasing her experience and passion within the industry. Her desire to buy her own pieces grew by the day and she finally started buying full time once the demand was big enough. Emma Cook admits she, "has never considered to be anything other than a designer" and her creative ways stemmed from an early age with her high heel creations made from her sisters building blocks and cello-tape. Luckily her artistic flair has since grown from her younger days and she now has an impressive 14 collections under her belt from clothing to shoes, accessories, swimwear and bags. As the designer herself confesses "Things just happened gradually after I left St Martins. Whilst working for other people, shops wanted to buy my own things, so I started doing it full time when the demand became big enough." We wanted to know more and to catch up with the British designer and ask her all about her business and her new collections. Emma Cook certainly transpires her cool, down to earth personality into her work, with her clothing nailing her own description of "easy to wear, but always with a sense of humour". True British inspiration is clear in all of her collections, staying faithful to her signature quirky prints and soft feminine layered fabrics in her newest SS14 collection. Cook is influenced by everything and anything in her life, from her hometown city of Manchester to the hustle and bustle streets of London. Specifically it is the way that these elements in her life are mixed up that give her the real creative flair that is taken the fashion world by storm. Her new SS14 collection, unsurprisingly epitomises Summer, with elegant prints cementing Cook's passion and the importance in her print designs. As she told us; "prints are the main focus of what we do, so we design all bespoke pieces in-house to make each and every one special". When questioned about the theme of her SS14 collection she revealed that a particular theme is not the starting point of her designs, it is however either a colour palette that the collection stems from, or sometimes a previous collection inspires the new designs. "For the SS14 collection we wanted to do something very tropical with a Mediterranean feel but using an unusual, surprising, and often contrasting colour palette. Bright, almost fluorescent pastel shades were used for the body of the collection with a mix of khakis and black to bring a unique blend of feminine playfulness with an cool edgy twist." 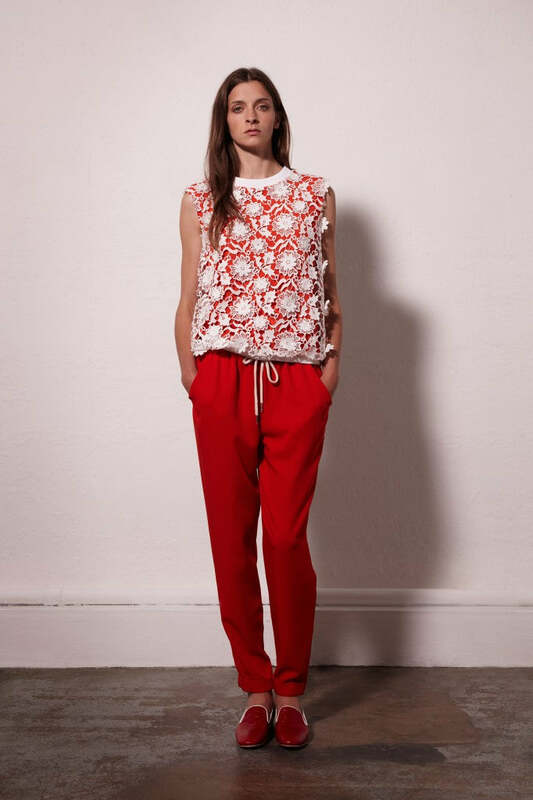 Her favourite piece from the Pre SS14 resort is the striking red jogging trousers teamed with the delicate yet distinctive red and white lace top, "I love wearing them together as a combination- it makes me feel like a beautiful boxed Mexican doll!" Emma Cook evokes a 'British with a touch of International' influence in her latest SS14 collection packed with exotic prints. However, it is her native England that she credits the worlds best dressed destination, encouraging us to recite the old fashion tale; 'Home is where the (heart) style is!". Cook likes many styles and can be considered a fashion chameleon herself, but it is the flamboyance of the British that really excite her fashion taste buds, "I love the boldness of English girls, the way that we wear things just because "we like them" rather than necessarily them being the most flattering item in the world. Us English girls don't really care and it is the way fashion should be! That's why London is so amazing, because you have such a great mix of different people and cultures" It is this blend of cultures together with unique confident personalities that inspire Cook's work and make her one of the UK's newest yet eternal front runners in fashion. The hub of Cook's stunning creations and the heart of the brand itself is her Head Office of 13 years in Dalston, London. This location is the designers home away from home and is where she credits the extensive process of all of her designs and professional work. When Cook is not spending her days building her growing empire, she loves to chill and unwind with her loving family at home. Having this relaxing space to clear her of London chaos, allows Emma to get her creative juices flowing and inspires the quaint and unique style of her designs. During this downtime, Cook loves to stay comfortable and incredibly stylish in her favourite Frame Denim Le Garcon Jeans saying, "They are the comfiest jeans I own and can be dressed up and down, worn with my girly printed tops as well as my casual chunky sweatshirts." These moments of private leisure time are sacred to the designer with her expressing her dream holiday destination being "Somewhere that doesn't have any other people and a lot of sun". Emma enjoys maintaining a fit and healthy lifestyle with frequent runs filled with a random music selection on her ipod. Various styles and genres of music are important in her daily life and add to her mix of cultures used in her fashion profession. Cook breathes a refreshing vibe on the British fashion industry and it is only a matter of time before her beautiful and endearing pieces are engulfing the fashion masses. Find her designs in the top high street stores, or find the woman herself dining in her favourite restaurant The White Rabbit in Dalston. Shop Emma Cook. Read more Behind the Seams Interviews.